Three children of Carmela Apolonio Hernandez – Yoselin, 11, left; Keyri, 13; and Fidel, 15 – smile as they make their way out of the Church of the Advocate to attend public school in Philadelphia. The family entered church sanctuary to avoid deportation. Bruce Beyer says claiming sanctuary in a church can be a powerful protest tactic, guaranteed to generate lots of publicity. 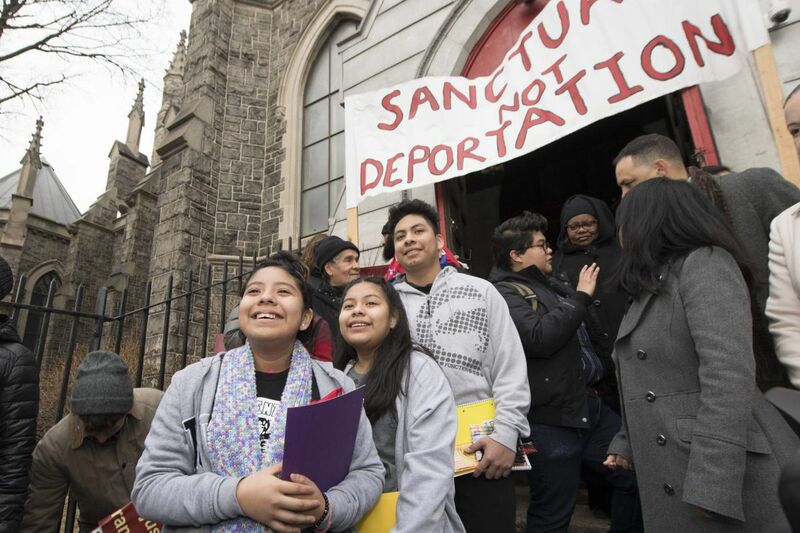 But nobody should think that moving into a church — as a Mexican family of five has done in Philadelphia, to avoid deportation — will ultimately offer much of a shield. In August 1968, Beyer and other Vietnam War draft resisters and activists took sanctuary in the Unitarian Universalist Church of Buffalo. After 10 days, a small army of city police, federal marshals, and FBI agents raided the church, thrashed anyone they could reach, and arrested the young men, who would go on trial as the "Buffalo Nine." Beyer, then 19, was sentenced to three years in prison for assaulting a federal officer, resisting arrest, and refusing induction. "The walls of the church don't protect you," said Beyer, now a 69-year-old retired stagehand living in Buffalo. "It's symbolic, and nothing more." Bruce Beyer, left, and Bruce Cline burn court orders demanding that they surrender to federal authorities in August 1968. Both resisted the draft, taking sanctuary inside the Unitarian Universalist Church of Buffalo. Today, amid escalating immigration enforcement under the Trump administration, churches have become a central theater of resistance here and across the county. The number of undocumented immigrants living in sanctuary nationwide jumped from five to 42 in the last two years. Since Trump's election, the churches, synagogues, and mosques ready to offer haven has surged from 400 to 1,110, according to a new report by Church World Service, a Christian coalition that assists immigrants and tracks sanctuary cases. More people are taking sanctuary today than at any time since the 1980s, the study said. That includes five in North Carolina, four in Colorado, four in New Mexico, and three each in Illinois, Massachusetts, Ohio, Texas, and Utah. Carmela Apolonio Hernandez and her four children, aged 9 to 15, have lived inside the Church of the Advocate in North Philadelphia since mid-December. All were ordered to be deported to Mexico, but Hernandez, 36, says that could get her family killed by the same gangsters who murdered her brother and two nephews. She made fresh headlines last month by deciding to send her children out of the church each day to attend public school — a risky challenge to U.S. Immigration and Customs Enforcement, known as ICE. So far, none of the children has been detained. ICE guidelines say agents should avoid taking action at "sensitive locations," which include schools, hospitals, and churches. But arrests have been made immediately outside those places, and no law formally blocks authorities from entering a church. Instead, people in sanctuary depend on an intimation of security offered by a concept that goes back to the Bible and its "six cities of refuge." It ran through the societies of ancient Greece and Rome, and became widely known through Victor Hugo's 1831 novel, The Hunchback of Notre-Dame — and later in the animated Disney movie of the same name. Today, in this country, a single factor drives people into sanctuary: the threat of imminent deportation. Moving into a church is the ultimate all-or-nothing play, destined to end in freedom or deportation. "With immigration law, being here counts," said Philadelphia attorney John Vandenberg, chair of the local chapter of the American Immigration Lawyers Association. "What I mean by that is, there are many forms of relief available to a person in the U.S. that could be discovered, or could be developed. Once you leave, that diminishes." Sanctuary generally doesn't happen quietly. It happens loudly, in front of TV cameras and crowds. And that's on purpose. Advocates seek the attention as a way to raise awareness of the circumstances surrounding a particular person or family — but also to build a broader public challenge to government policy. The publicity alerts ICE to the exact location of a target, but it also ensures the agency would pay a price in public relations for dragging someone out of a church. The prevalence of cellphone cameras means authorities can't take action without people finding out. But sanctuary isn't easy. Usually, once someone steps inside a church, there is no stepping out. It's assumed that ICE agents are watching, either in person or by remote camera. It's stressful to stay within the same walls, the same limited space, day after day. Hernandez and her children occupy a room in the church basement, with mattresses on the floor and a microwave oven in a corner. "I didn't realize how hard it would be," she said in an interview. "But when I look at my children I get a lot of strength. They are what keep me going." It could be a long stay. In Philadelphia, Javier Flores Garcia left the Arch Street United Methodist Church in October after almost a year inside, having been granted "deferred action" to await a visa. The hardest part, he said on the day he left, was the monotony. He painted almost all the church interior and volunteered for any job he could do, trying to keep busy. "Sanctuary isn't the goal," said Kristin Kumpf, director of human migration and mobility at the American Friends Service Committee in Washington. "It's an opportunity to keep families together temporarily, while we're fighting that person's case and fighting the system." That means battling an administration whose immigration-enforcement arms have grown more aggressive. People who were granted stays of deportation under the Obama administration have been detained and deported at what they expected to be routine check-ins with ICE. Late last month, ICE formalized a policy that sends agents to make arrests in courthouses, ignoring advocacy groups that say those actions frighten away crime victims and witnesses. The directive said agents will enter courthouses only to nab specific targets — gang members and criminals, but also people with deportation orders. "I wait every day to hear they've gone into a church," said Judith McDaniel, an attorney who teaches law and social change at the University of Arizona in Tucson. "The publicity, the community support, are the only defenses we have." Many people think authorities should enforce the law — period. Groups like the Federation for American Immigration Reform (FAIR) in Washington say sanctuary seeks to thwart federal law and block legally sworn police from carrying out their duties. A church setting doesn't exempt anyone from the law, FAIR officials say, and religious leaders who harbor undocumented immigrants could face charges. In the 1980s, the federal government prosecuted 18 priests, nuns, and lay people it accused of aiding undocumented migrants fleeing civil wars in El Salvador, Nicaragua, and Guatemala. Eight were found guilty of smuggling immigrants, though most received suspended sentences or house arrest. At the time, McDaniel belonged to a sanctuary congregation in Albany, N.Y., and helped drive Central American border-crossers to safety in Canada. "I don't think anyone backed off, even after the convictions," she said. Moral convictions against the Vietnam War led University of Buffalo students into the Unitarian church, a local landmark designed by Edward Austin Kent, who died aboard the Titanic. The first days of sanctuary were kind of a party, as scores of students gathered outside, lying on the grass and enjoying the summer sun. Judy Collins showed up to sing protest songs. Students gather on the steps of the Unitarian Universalist Church of Buffalo in August 1968 to protest the Vietnam War. Some took sanctuary in the church to resist the draft, including Bruce Beyer, left, with his back to the camera. The calm didn't last. On Aug. 19, 1968, Jerry Gross, 22, held a protest sign as he stood lookout at the front door. Now a 73-year-old, well-known Oregon artist who goes by Jerry Ross, he recalled that police used a bullhorn to tell the resisters they had five minutes to surrender — then rushed the church two minutes later. "This idea of a sanctuary, I have very little faith that can protect anybody," Ross said. "I think the idea is great, the thought is great, it's a socially responsible way to respond. … But in reality, unless you have some kind of force to prevent attacks, there's no way you can prevent them from coming."